Last week, Gripped Films was in Colorado at Wheat Ridge Cyclery shooting interviews with the riders of the 1986 7-Eleven squad. 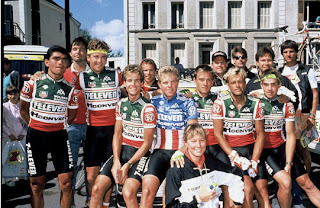 It has been 25 years since this American team raced their first Tour de France. The film segment will be aired twice this Sunday, July 3 at 12:00 p.m. on NBC (MST), and again at 6:00 p.m. on Versus (MST).